Following the great success of the New Vision Tarot and the After Tarot, this is the third volume of the Trilogy: the Before Tarot. The traditional images of Tarot are now portrayed a few moments “before” they happened. Each of the Arcana opens a wholly new window into our understanding of the cards, adding a time dimension to what we see and know. The kit includes a 160-page book is written by renowned American writer and Tarot expert Corrine Kenner. Both editions are scheduled to be released from June to July 2018. 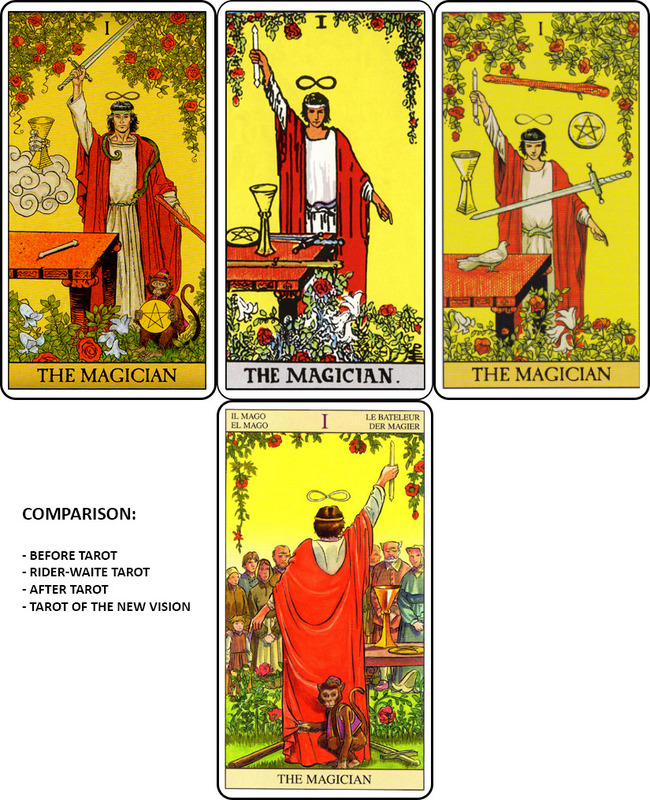 I already have the Tarot of the New Vision Kit, the After Tarot Kit, and the Vice Versa Tarot Kit. Since I wish to complete this exquisite quartet, getting the kit version of this deck is a no-brainer for me. I have all of them too, I just love these types of decks! Thank you so much for the pictures! Lol me too, SaturnCeleste. You're welcome. How would you read this one? Are the meanings changed since it's a different moment in time? I had this same conundrum with the After Tarot. I just went through it and put it away for later study since I wasn't sure. Since the end of last year, I planned that 2018 would be the year that I plumb the depths of the RWS system. I wanted to study not only the manifold interpretations of the card images that I have grown to love - I also wish to explore even more creative perspectives on the cards themselves - both locational and temporal/time-based. That's why I purchased the sets with the companion books - I wanted to read some refreshing viewpoints on what may be happening in front or behind the image depicted in a card, just before or immediately after the events portrayed in them. I know that with these decks, it seems like a limited before/after interpretation is forced on the cards, but that's not entirely accurate. You can rely on what the books say, but I believe that the real lesson these decks want to impart is that you certainly can interpret them however you want to, as long as you sincerely believe your own vision. What I noticed about myself is that I simply relied on what books say regarding card meanings. What I wish to see is how others can exercise their imagination in fitting a card's arsenal of interpretations into the various spread positions they may find themselves in - in this case in the Past (for the Before Tarot) and Future (for the After) placements. This might give me some ideas on how to be more creative, more lateral-thinking, and less dogmatic when I read a card. I'm a very left-brain person, so I think this would be a perfect exercise in strengthening my intuition, which I feel has been growing lately. And yup, as with the other decks in the quartet, for the Before Tarot I plan to use the card meanings detailed in the companion book along with the personal interpretations that I shall come up with on my own. I aim to use them on readings that explore events that happened in the past like relationships that ended, karmic readings, uncovering important actions that already happened, investigating synchronistic events, etc. I'm pretty sure that the book would have even more fleshed out suggestions as to how the deck can be used. Thank you so much EmpyreanKnight for the well thought out response. I can see this will take a bit of work on my part, but anything worthy does. I have learned more about RWS in the last year than I ever have before. I think some lateral thinking and differing interpretations will do me some good. It was released apparently globally on the 1st of May! I love the idea of what went on before, just like the tarot of the new vision and after tarot. The concept is strong. But I think the reality is not so great (although they are all lovely decks). When I see comments and reviews of the previously released decks, there is always a few of the images that people hate, they never imagined that scene happening. I think that's the issue with this, it's great to let our imagination work out a different angle, what happened before and after, what's happening elsewhere in the picture. But the decks are someone else's idea of that and the issue comes when it is different to what we thought would happen. It seems like it's the deck-only that's available for sale right now. I'm angling for the kit so I'm going to have to wait until September. I'm excited! Seriously tho I love these themes. I'm gonna get this one to complete my quartet. Just ordered the Before Tarot Kit! I also have the kits for the After Tarot and the Tarot of the New Vision (However, I skipped the Vice Versa deck). I made a little montage in Photoshop. It looks nice!! I'm all in for the Side, Top, and Bottom Views! Lo Scarabeo, make this happen! I must order this, as I have all the other decks mentioned and find them extremely interesting to do readings with.